Mivizu, a New York based design house dedicated on delivering the very best in styling technology since 2011, introduced the iPhone 4 case specially design for Verizon users. Committed on providing quality products, customer service with time-to-time design changes, the Mivizu iPhone 4 case is surely the best when compared in pricing, design and quality. With recent availability of the iPhone 4 over Verizon’s network, various companies have been hard at work on delivering the very best when the word comes to ‘Covers’. 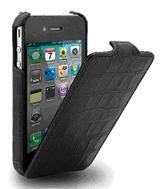 The Mivizu Sleek Leather case gives your iPhone 4 the best protection without adding bulk material to the case. We are quite excited to have worked on a new design signature ID to our cases and resulted in a fashion inspired, Mivizu Primo Croc leather case.